Personalised Glasses Case. Personalised Photo Glasses Case. For the person who likes to make a bit of a statement, our personalised glasses case is here to protect your specs and make them look super stylish. Made from a durable, shatterproof plastic, this hard glasses case has a secure click and close action lid, a soft, felt interior and comes with a microfibre cleaning cloth, which you can personalise to match. This personalised photo glasses case is perfect for glasses and sunglasses of most sizes. Made from a strong and durable shatterproof plastic, our personalised spectacle cases are the best way to make your glasses stand out as well as giving them the protection they need. This photo hard glasses case is sleek and smooth, with an elegant curved design and features a universal shape, so glasses of most shapes and sizes will fit. It features a secure click and close action lid and a moulded felt lining for added protection. The durable nature of the material means that your glasses have extra protection from knocks, drops and bangs. Design your own glasses case and you can even design the soft, microfibre cloth to match. Our glasses case measures: 18 cm long x 7 cm high x 4 cm deep, so it is the perfect size for popping in pockets, handbags, suitcases, school bags and even a clutch. Our personalised glasses case is assembled by us. We print onto the case, ensuring your designs cover the entire product, for an amazing out of the box experience. I have ‘Bags of Love’ for this company!! What Will My Personalised Hard Glasses Case Look Like? Your glasses case will look amazing when printed with your own design. Our honed printing techniques allow us to wrap your design around all sides of the Personalised Glasses Case. We print by fusing your design into the material of the case, so the print looks bold, strong and fade-resistant. We are so confident that you will love your customised glasses case as much as we do, that we have put a two-year guarantee on them. This custom glasses case can be used for not just regular glasses but for sunglasses too. A personalised sunglasses case is great for keeping your shades protected, whether you are packing them in your suitcase or in your handbag. Our Personalised Sunglasses fit perfectly in this case, so why not create a fully customised set and look cool, no matter the weather? Forget just printing on the top and bottom of your customised glasses case; at Bags of Love, we print your design onto the entire case, meaning, you can make your own designer glasses case with all over print. We use a specialist 3D printing technique to print both parts of your hard glasses case. You can print on two areas of the case and we wrap your designs around the edges, creating a flawless and continuous print. This means that every part of your cool glasses case will be customised. Please note: The small space between the lining and the case is necessary, so please do not try and pull the lining away thinking it's peeling off. This space ensures that the lining isn't too tight for when you open and close the flip top case, potentially causing it to come away completely. There are two printable areas on the hard case - the top and bottom. We print each area individually, before assembling them by hand. When uploading your design, it is important to remember that the design will be wrapped around the sides of the case, so any images placed close to ends, will be warped slightly. We recommend that if you are using photos or a logo, to make sure that they placed centrally, so the wrapping doesn't inadvertently affect them. Personalised glasses case makes a great gift for boys and girls alike. If you are designing the case as a gift, then ask yourself, who is this for? 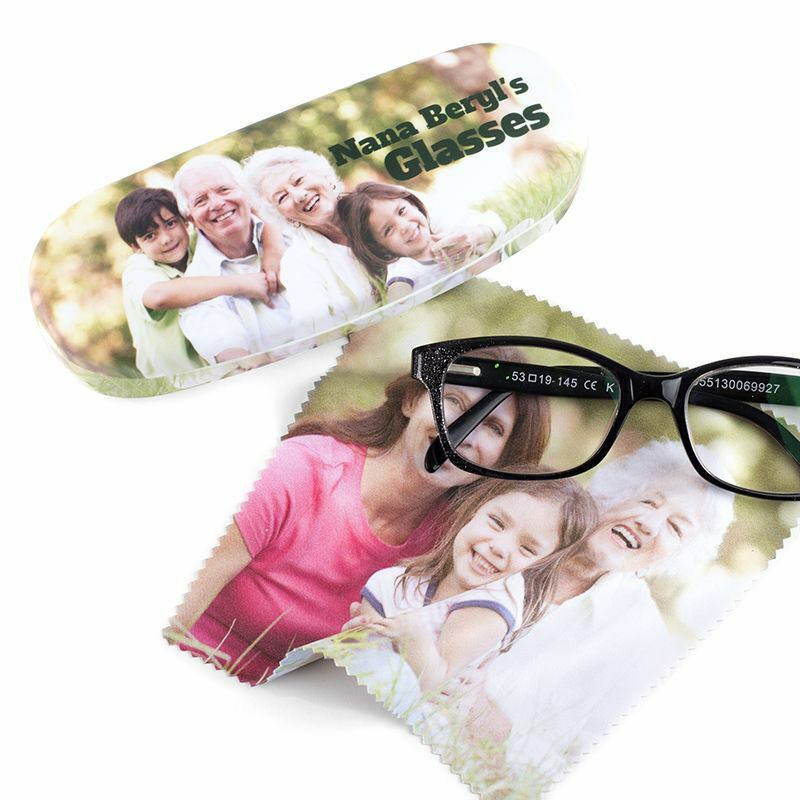 If you are designing a glasses case for your nanny, a child's painting or a photograph of the grandchildren, with a touch of text such as; "Grandma's Specs" or "Nana's Reading Glasses" would look brilliant. If your little one needs to wear glasses and is feeling a little shy about taking them to school, then why not create a cool design, which they will want to show off? From their favourite characters to their favourite singers and even add their name, so there is no risk of misplacing them - and it will keep those precious specs safe and secure when bouncing around their bag. Men's and women's heavy duty, hard shell eyeglass case can be customised for mummy, daddy or even the whole family. Are you someone, or do you know someone, who is forever looking for their glasses? They search high and low and can never find them. With our stylish, personalised glasses case, you can make those tricky specs easy to spot and locate. Create an eye-catching design, which will be easy to spot, no matter where you leave them. Our personalised hard glasses case is perfect for most size glasses. Design your own zip top handbag personalised with your favourite photos and text. 100% secure zip top shoulder bags. Complete your outfit with your own personalised sunglasses. UV-Protection with style.